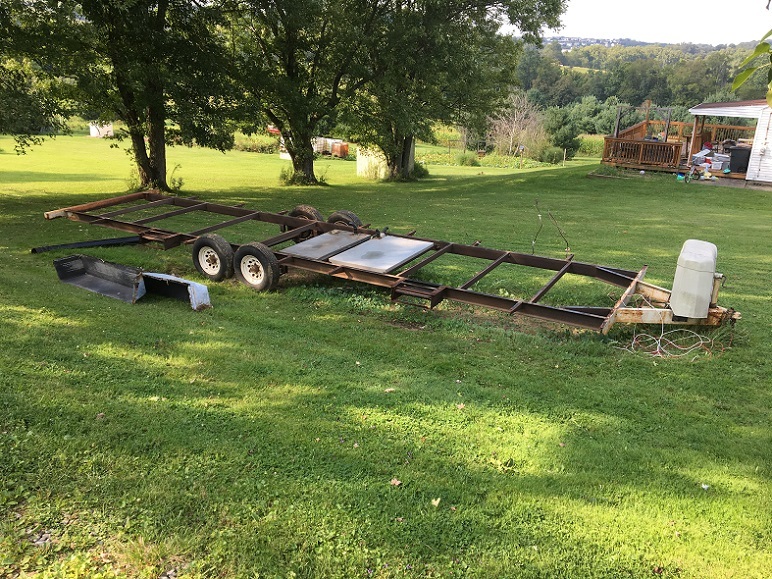 Good Afternoon, Well getting a chance to get back to some projects, the enclosed car trailer donor is getting stripped, pull the floor off tomorrow. Well Terry, this is Monday. You should have it finished by what, this weekend? Good luck with that! Pulling up that floor had to be the most strenuous part of this tear-down. As rotten and as easily as the walls and roof came down, that floor was SOLID!! !...at least in the middle. I tried using a pry-bar and hammer to pull it up. But it was glued, screwed, and stapled down. Eventually, I had to run a circular saw over it to pull it up in sections. But I got 'er done! Mind you half the fun is the way Ron tells the stories about Emmett. Emmett had a banner day yesterday. While outside getting ready to break camp, he managed to get the lid off my coffee mug and was drinking my coffee/cocoa. Stopped for fuel in Jasper and ran into Walmart for bacon and sausage. Emmett ate a roll of paper towels. When we got to the Martin Dies State Park, I changed sites and had to go back to office. When I got out of car to go to office he spilled my drink in car. When we got back to camp and I went outside to hook up water and electric, he spilled the beer that I had just opened. If we are having a battle of wits, Emmett is winning. Ron - don't give up. You may be behind but you will catch up. I believe he is a good companion for you. Perhaps he is ADD!! Sure a lot of energy in that small body. Good Afternoon, Taking a break, hot here in the great northeast, but I'm not complaining! I know whats coming, . Ron, I'm sorry but I can't help but laugh he sure is a little devil . Down to the plywood on the donor frame, Bob, I know what you mean, I've pulled several of these down and I haven't run into one yet that just fell apart. I must agree, it appears Emmett has this in the bag. Good Morning, Another nice day here, Well got the future enclosed trailer stripped, now it's cleanup time, will take the aluminum to the recycle yard, should get enough to pay for the dump fees to get rid of the scrap that's N/G. Put up the old windows on Craigs list, maybe someone will need them, I'm not going to use them. Next step will be to clean up the frame and cut off everything that is not needed, then figure out the steel, aluminum and axles that will be needed, this will be an easy build, pretty straight forward a box on wheels. Gordon I had to use a sawsall for the floor removal where was you? Can't help but laugh at this...thanks for the giggle this morning. Terry sorry I was not there. I suspect though you did extremely well with the sawsall, much better than I could ever do. I would be happy to take lessons from you. Well glad you have a new project. Arrowhead Marina & RV Park, 2 Van Buren Ln, Schenectady, NY 12302.